The 6 million Jews who allegedly died in the holocaust is prevalent. It is in the news every day almost. Old Newspaper in the video below Says SIX MILLION JEWS Died in 1915-1938 Before Holocaust. What do you think. Is the alleged holocaust of 6 million a mere construct or is it somehow based on reality. The critics of revisionism suggest that the 6 million constantly mentioned is a mere coincidence: I think not but somehow a part of prevailing mythology, a construct. You can change your vote in the poll after you see the video. 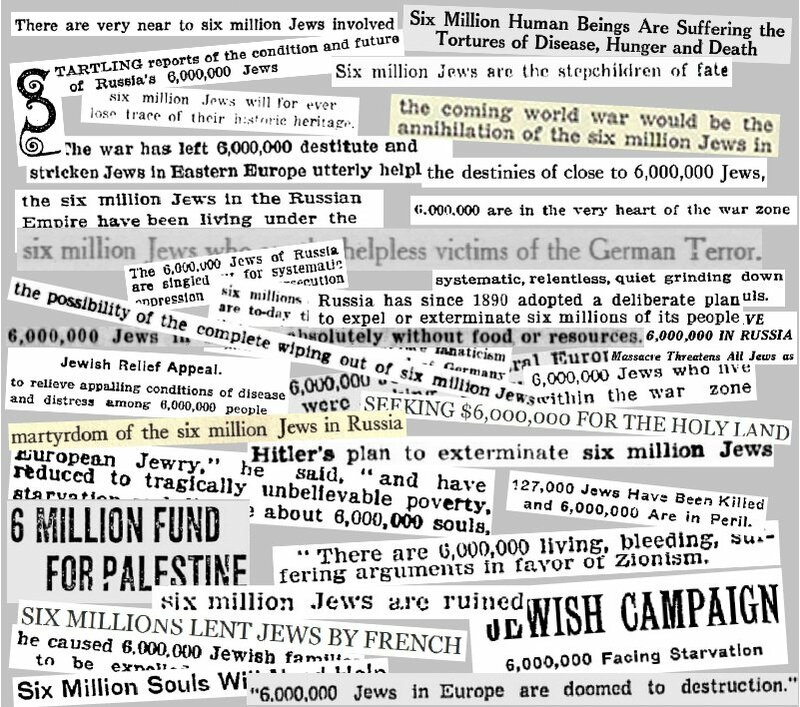 The earliest newspaper reports are referring to 6 million Jews in Russia. Then it changes to help for the Jews of Europe. Is there is a link to the original, somewhere it is easier to read? Socialist Germany is that they didn't get the $. The $ in Germany came from Work not scheming. The day of the Jews are done. Which is not what the newspaper articles are saying. The reality is that the 6 million in the alleged Shoah is a culmination of 50 or so years of Jewish swindling people for $$$$. All on the same pretext. 6 million will perish if you don't pay.. The Nazis were not hoodwinked by that swindle, seeing it as it was: a scam. Nessie doing what he does best. What did I say about Nessie being a troll and operating in bad faith, splitting unnecessary hairs and shifting the goal posts? Exactly. The fact that six million were being claimed then, and prior, and even after, is one of many proofs that Jews were deceptively engaging in a constructed self fulfilling kabbalistic prophecy regarding a return to the coveted holy land. Kind of like the Christians who always preach an imminent rapture. Nessie can whine over details about total populations all he wants. We don't know how accurate the numbers were anyway that Glynn gave. The fact that he and others claimed six million simply backs up my point that we have lying kabbalists at work who are also political. A few threads ago, Aaron Richards thought he would be really smart and point to a few isolated claims of five or seven million. Which shifts the goal posts from the evidence I have directed people to contained at codoh and in the youtube video. The fact that Jews SETTLED on six million and many more continued to claim that number proves, once again, that we have lying kabbalists at work who are also political. Aaron Richards fails again and misses the forest for the trees. The 6 million is a religious number and there were religious reasons for SETTLING ON THAT ONE as opposed to the other ranges in the 4 million, or 7 million. In it he explains the kabbalistic importance of the 6 million, which is described further in great detail by a Judean Ben Weintraub in his book The Holocaust Dogma of Judaism, written probably as a warning to his tribe that the truth is out there, and that the Whites will not stay asleep forever. There is much more that could be said, and we have hardly mentioned the alleged gas chambers, but there is no reason to belabor the point. Germar Rudolf, and others have eloquently and exhaustively refuted this cruel confabulation. The laws enforcing public belief in the Hollow-Co$t are made out of fear of the facts, or in many cases, lack of facts. It does not take the proverbial rocket scientist to discover flagrant flaws in the so-called evidence that would not hold up in a simple debate format. That is why the truth deniers never permit open debate, and of course, never allow revisionists a voice on their carefully controlled and contrived media. So far, the Internet is an exception, but that could change. Efforts are already under way. Let’s take a further look at the mystical roots of certain numbers and words. Holocaust Dogma Of Judaism says: “According to Rabbi Yitzchak Ginsburgh in The Alef-beit: Jewish Thought Revealed Through the Hebrew Letters, the letter vav, w equals 6. The Zohar, one of the holy books of the Jews, reads, ‘He created six’ which Ginsburgh equates to the six days of Creation and the six extremities of space signified by the lulav and etrog shaking on Sukot, as taught in the Kabbalah. The secret of the word truth resides in the triangle of 6, he says, and for this reason the letter vav is known as “the letter of truth.” In the first word of Creation in the Zohar, we are told by Ginsburgh that the Alef, or first letter, signifies 1,000. Bear the symbolism of the number 6 in mind as you recall that the number of square feet in the Hall of Remembrance was 6,000, as is the number of children’s hand-painted tiles. Truly, the number 6 is everywhere.” As you may already know, the so-called Star of David is a six-pointed hexagram, two triangles overlaid, a sexual symbol in its most ancient use. Weintraub tells us more. Werd some of those links do not work. Could you locate them please.